India registered a 3-2 victory against Cambodia in an exciting five goal entertainer at the Phnom Penh Olympic Stadium on Wednesday, 22nd March 2017 in the FIFA International Friendly. This was India's first away victory in an International Friendly since June 2005. Gurpreet Singh Sandhu was given the captain's armband for the fixture while Anas Edathodika in defense was handed his senior debut, being named in the starting lineup for the Blue Tigers. Milan Singh also got his first International cap for the Blue Tigers after coming on late in the second half as substitute for Rowlin Borges. Sunil Chhetri gave India the lead from a tap-in when he found himself few strides from the goal completely unmarked from an Eugeneson Lyngdoh corner. Cambodia equalized in the very next minute through Khoun Laboravy after his half volley found the back of the net from a well orchestrated move from the left. The two teams went all squad into the half time. Two quickfire goals proved to be the decider after the Blue Tigers were the quicker to get off the blocks in the second half. 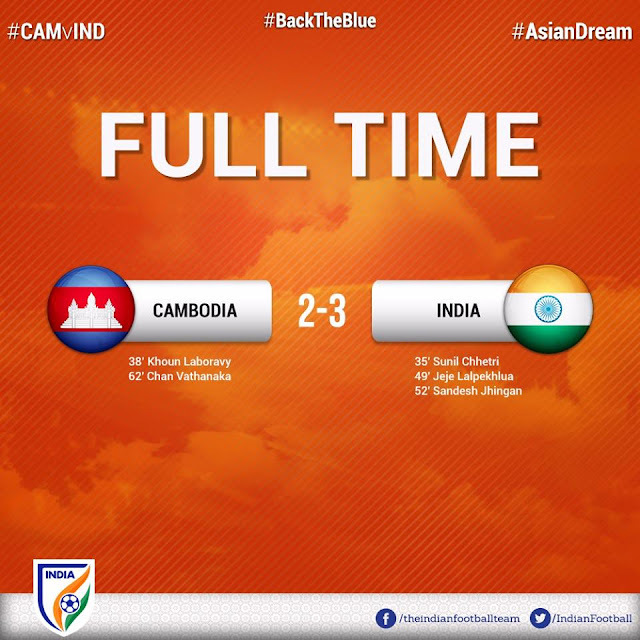 Substitute Jeje Lalpekhlua(49th) regained India's lead when Jackichand's solo run opened the Cambodia defense with Jeje applying the finishing touch as the ball crossed the goal line after it struck the far post. Three minutes later, a training ground exercise was executed to perfection with Jeje's flick from a Eugeneson Lyngdoh corner was headed home by Sandesh Jhingan silenced the extremely passionate 70,000 supporters. The home side were not to give up yet as they piled up the pressure on the Indian back line. Chan Vathanaka pulled one back for the hosts with a fine solo effort wrong-footing his market before unleashing a low driven shot which Gurpreet failed to get his fingertips on. The scoreline remained 3-2 for India as the Blue Tigers registered an elusive away win much to the delight of coach Stephen Constantine as the focus now shifts on the AFC Asian Cup 2019 UAE Qualifiers.